One of the best things about Melbourne is that there are pockets of natural bushland and parklands quite close to the city. 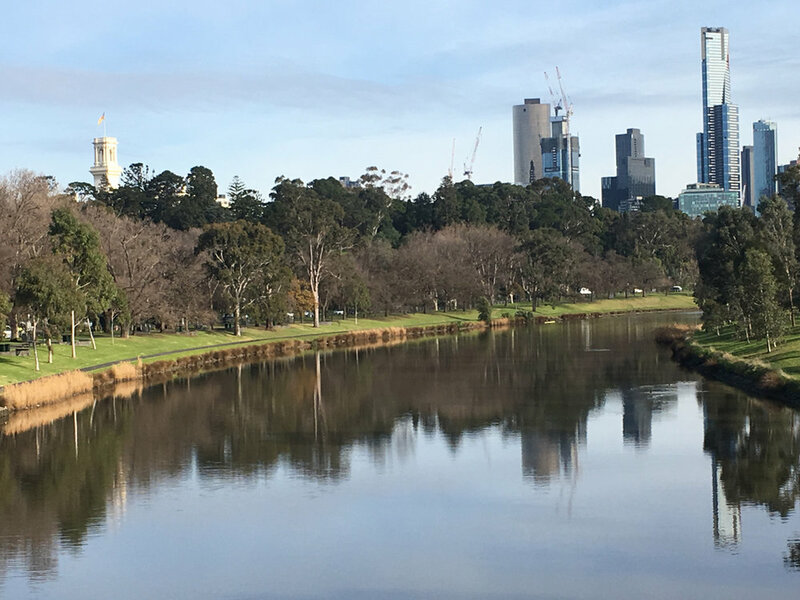 This charming ride takes you through Yarra Bend National Park and other parks as it follows Melbourne’s iconic river – the Yarra River. It starts at Dennis Station in Northcote and finishes in the city at Flinders Street Station. As you ride you might like to stop and look at Dights Falls and the fish ladder there. Or you may like to visit Abbotsford Convent with its interesting history. Originally it was the site of a meeting point for the Wurundjeri and Kulin Nation peoples before becoming a large convent. It is now an artistic hub of Melbourne and has an excellent café. Opposite is Collingwood Childrens Farm, the oldest children’s farm in Australia. This also has a café. The land has been farmed continuously since 1836. Further along, in Richmond, are some lovely old railway bridges. Just before the ride ends you pass through Birrarung Marr. It is named in the Woiwurrung language of the indigenous Wurundjeri people, with Birrarung meaning “river of mists” and Marr referring to the river side. The best place to have a break is either Abbotsford Convent or Collingwood Childrens Farm. Alternatively, you could break at the start of the ride by visiting Fairfield Boathouse or at the end of the ride in one of Melbourne’s many cafes. There are toilets at the convent and outside the children's farm. There is also a toilet 250m off the path just after Swan Street. It is signposted on the Trail. The ride is undulating with a couple of steady climbs. There are stairs to climb with a gutter to wheel your bike on. But these can be avoided if desired by following the route in Variations. Old Rail Bridge, Belgrave-Lilydale Line. Start at Dennis Station on the south side in Cain Street. About 50m to the east of the station entrance is a walkway leading south to a roundabout. Head straight down the walkway and through the roundabout onto Bower Street. Continue south on Bower Street to Westgarth Street. Turn right into Westgarth Street, then take the first turn left into Westfield Street. Follow Westfield Street south to Heidelberg Road. Walk a few metres to the left and cross Heidelberg Road to reach Yarra Bend Road. Follow Yarra Bend Road to the “Melbourne Polytechnic” sign. Turn right here onto the bike path. This is the Main Yarra Trail. Ride down the hill as the Trail follows the Merri Creek downstream and goes under the Eastern Freeway. Turn hard right to cross Merri Creek and enter Dights Falls Reserve. Go straight ahead past a side path on the left to the viewing platform for the falls. Just after this, at the next intersection, do not go straight ahead and up the hill. Stay left to follow the river. Follow the Trail until you reach the Gipps Street Stairs. On the way you will pass Collingwood Children’s Farm and Abbotsford Convent. If you wish to avoid the stairs, see the alternative under Variations and Maps. Climb the steps using the gutter on the right to wheel your bike. At the top of the steps, turn left to cross over the footbridge and then go straight ahead. Stick to the sealed path to go up to Yarra Boulevard where the path turns right and goes steadily uphill next to the road. Take the first sealed path on your right and go downhill to cross the Yarra on the footbridge. Turn right and take the ramp down to the river level. Follow the Trail downstream keeping the river on your left. You will go under several roads and two rail bridges before going under Olympic Boulevard. Soon after Olympic Boulevard the Trail turns right. Follow the Trail over the elevated bridge at Birrarung Marr then turn left and go straight until you reach St Kilda Road. Flinders Street Station is just across the road. Exit Collingwood Station onto Gipps Street. Turn left and follow Gipps Street until you reach the top of the stairs after crossing Nicholson Street. Follow the ride above from Step 13.
preceding this ride by Yarra Trail 2. At Yarra Bend Road follow this ride from Step 6 above. Off to the Western Bay. adding City to St Kilda Circuit at the end of this ride. at the Morell Bridge, do the Elwood Canal and Albert Park Lake ride in reverse. If you are riding downstream from the north, you must wheel your bike up the steep Gipps Street stairs. To avoid this exertion, replace Steps 11 and 12 above with the following. Note that this alternative route is shown in deep pink in the Google map below. Follow the trail to the entrance to the Collingwood children’s farm. Turn right and ride up Heliers Street. At the T intersection with Clarke Street turn left. Ride south down Clarke Street and then turn right into Yarra Street. Ride west along Yarra Street to Nicholson Street. Turn left and ride along the bicycle lane to Gipps Street. At the traffic lights turn left and ride down Gipps Street until you get to the stairs. You are now back on the Main Yarra Trail. Go to Step 13 above. The section shown in deep pink is the alternative route to miss the Gipps Street steps.